There are several options to consider when it comes to upgrading or replacing an old and cranky ERP system. According to Brian Sommer of TechVentive, board members want to see companies move to digital business models, and your company can’t get there with grandpa’s Oldsmobile version of ERP. Smart IT buyers can see ERP technology is undergoing a generational change – one that only happens every 10 to 15 years – and if the vendor you’ve always used for ERP doesn’t have what you need to compete in the AI era, or at least have it on their roadmap, then it’s time to reconsider your investment. 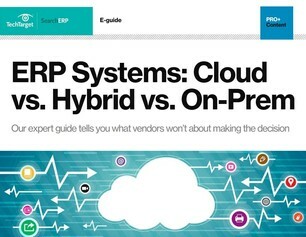 Our expert guide ERP Systems: Cloud vs. Hybrid vs. On-Prem tells you what vendors won’t about making the decision. Take our TechTarget survey to for an immediate download of the guide, and uncover the truth about a costly ERP investment.